St. Mary’s County Regional Airport is among the only expanding, general aviation facilities in the nation. The number of pilots is declining as the largest population of private aviators, the World War II boys, are not being replaced by younger pilots. As a result, regional airfields across the country are closing. St. Mary’s Airport began bucking that trend in the early 1990s, when the Naval Air Systems Command moved its headquarters to the Patuxent River Naval Air Station resulting in a population boon filled with aviators. 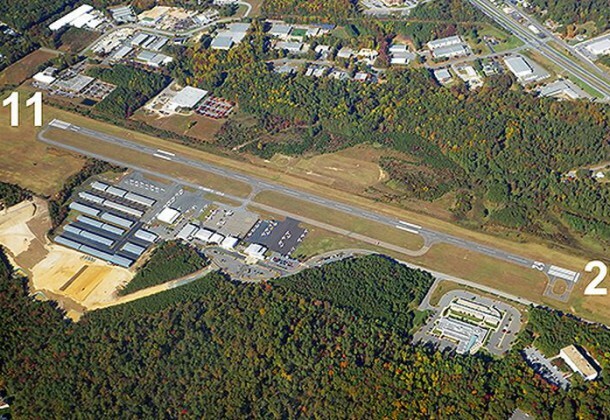 Uniquely in regional air transportation, as the surrounding population ballooned, the corresponding growth at St. Mary’s County Regional Airport was largely privately funded. S. Hunt Aero recently added needed space for 77 more general aviation hangars; seven large hangers; and constructed the 11,050 square foot combination of three hangars, office space, laboratory and other support spaces for the University of Maryland Unmanned Aerial Systems (UAS) Test Site. The company’s ambitious development of an aviation and technology campus at the airport are proving successful. Plans for an auxiliary classroom building at the airport property are nearly approval. There are additional plans for a helipad; and a potential unmanned aviation vehicle operating area. More than 100 contractors worked nonstop for more than a year ready this campus for the University of Maryland facility, opening St. Mary’s County to a wide array of UAS opportunities. St. Mary’s County government opened the airport in 1969 with a small runway, no buildings, and 10 planes. Airport Properties, Inc. built a 10-unit hangar in and the original state police hangar in 1987. That hanger is, now the Medstar helicopter hangar. Additional private investment added another 10-unit hangar in 1989. Private investment continued to build the airport through 1998, drawing increasingly sophisticated companies and aircraft. Mostly government funds went into construction of a terminal in 2002, but the economy has prove more supportive of corporate jet travel than airline shuttles and the terminal has mostly been used as office space. Continued private construction through 2010 drew increasing numbers of aircraft and commercial expansion to the airport. Private investment leveraged the construction of the State Police Hangar at St. Mary’s, guaranteeing St. Mary’s residents can receive emergency services within the “golden hour” medical professionals say is often the difference between life and death. This unusual arrangement, amounting to $7.6 million of private investment driving development of a public airport, returns nearly $1 million in taxes to state and local governments. On top of direct government return, the economic development catalyst of a growing airport is significant. For example, in response to the surrounding communities’ growth since the 1988 BRAC, private development has provided the corporate jet access needed to draw franchise establishments and large contractors to the region. Many of corporations are more likely to locate franchises and offices where ease of quick in and out access exists. The ongoing development by S. Hunt Aero is additionally providing St. Mary’s County with the long-sought connector between Lawrence Hayden Road and Airport Road. Landlocked acreage adjacent to existing neighborhoods will open to residential development in the heart of where it is most needed. And the configuration of the campus and new corridor also makes available space for specialty businesses to locate at an expanding airport. After the 9/11 attacks on the United States, another huge wave of change hit general aviation. And it had an immediate and immense impact on St. Mary’s County Regional Airport. St. Mary’s became the closest general aviation airport to Washington DC outside the new no-fly zones. The need for hangar space was immediate and continues to grow. Already, says Mr. Reed, a great deal more operates from the St. Mary’s County Airport than the general public realizes, including Pilots ‘n Paws, a volunteer animal rescue program and Young Eagles, an extraordinary program where pilots volunteer to take young people up in a plane to introduce them to the wonders of aviation.